From logistics to safety, SCE crews work in tandem with a diverse support team. SCE Air Operations pilot Brad Bohlmann holds a safety meeting with the crews. Damian Spampinato, SCE e-crew foreman, holds a safety meeting with his Santa Ana crew. 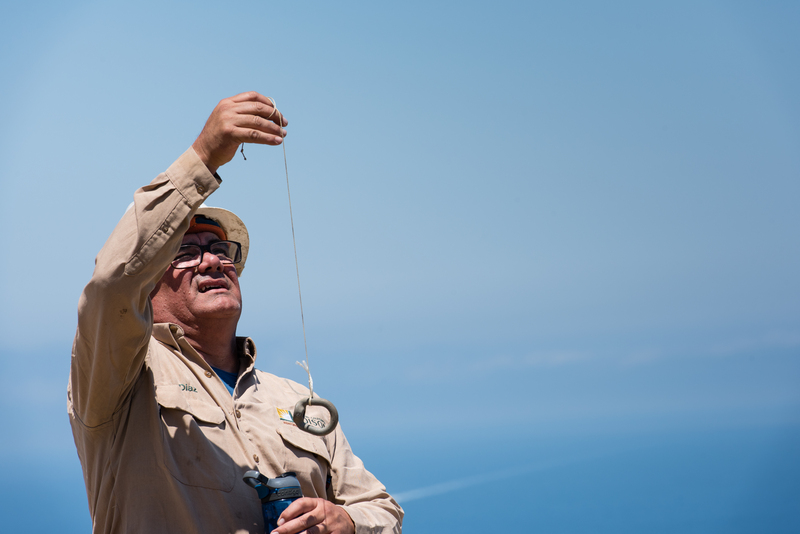 Joshua Regalado, SCE district manager for the Orange Coast, oversees the pole-setting project on Catalina. AVALON, Calif. — As the Southern California Edison truck winds along steep rocky roads, a large canopy comes into view. 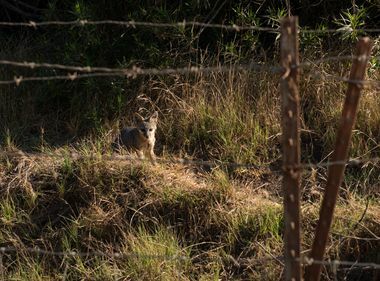 It’s a rare site among the brush-filled mountains, areas closed off to the general public on Catalina Island. As the truck nears, the large black canopy stands over simple plastic tables and folding chairs. The SCE logistics team is unloading a truck full of lunches, drinks and snacks, all to ensure the crews working on the side of the local mountains are taken care of as they set new fire-resistant poles. It’s all part of the company’s efforts to improve the overall resiliency of the grid. “We are here to support the crew with food, shade, water and to help them on-site and get them whatever they need,” said Sal Guerra, SCE logistics specialist, who has been on the island since early July to help with the pole-setting project, going home to his wife and kids on the weekends. Crewmembers work to straighten a composite pole. For logistics team members like Guerra and Hajas, half of their job requires picking up and delivering mail, freight and tools. The other half involves deployment to different job sites, such as the composite pole-setting project on Catalina or in response to a storm or weather incident. 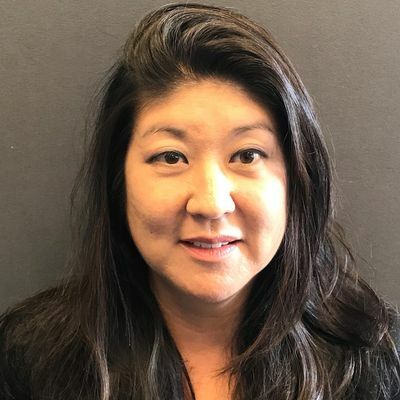 “Those guys are priceless,” said Joshua Regalado, SCE district manager for the Orange Coast, which includes Huntington Beach, Westminster and Avalon, of the logistics team. 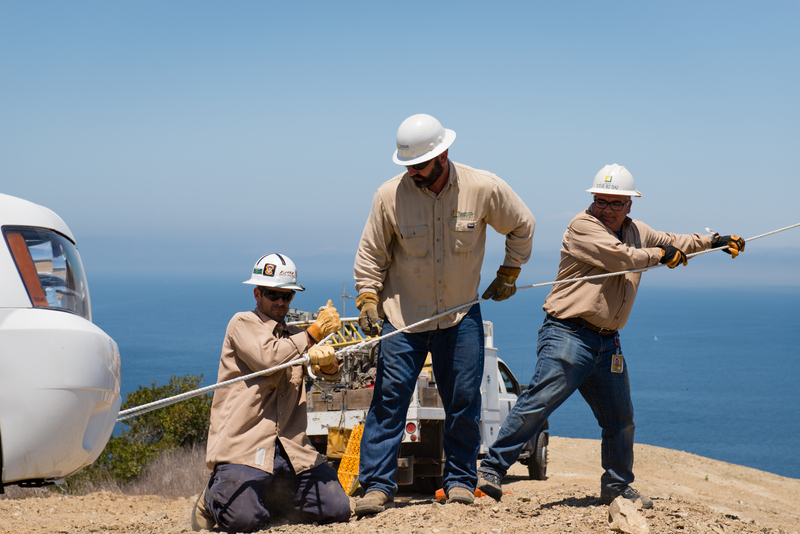 He is overseeing the pole-setting project on Catalina that is scheduled to end in early September. 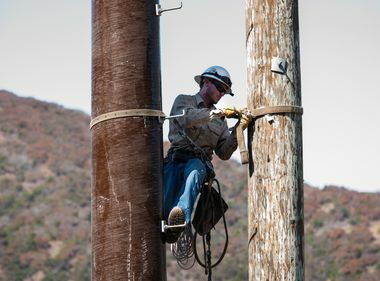 Working alongside the three five-man crews as they prepare to set two new fire-resistant composite power poles, 75 feet and 65 feet each, is the safety lead. Safety lead Steve “Bo” Diaz uses a weighted string to check on a pole's straightness. In addition to Diaz’ watchful eye, the crews hold several safety tailboards or discussions before the pole-setting work begins. We are running this like a storm response, that’s what makes this project unique. That’s why all these districts are involved. They are all working together in conjunction as a great demonstration of teamwork. 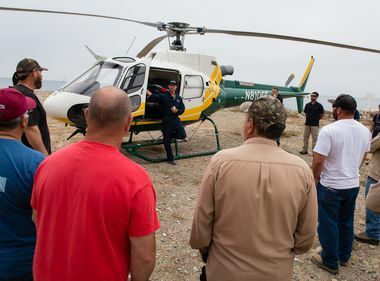 One of those safety tailboards takes place at the Pebbly Beach Heliport where SCE Air Operations pilot Brad Bohlmann goes over several safety measures with the crews as they prepare to set the fire-resistant poles on top of steep, rugged cliffs that are inaccessible via trucks. Bohlmann notes the team will need to wait about an hour for the clouds to dissipate before the work can begin today. His part, he says, should take about an hour as he flies in not only the new poles but also brings the crews’ equipment to them so they don’t need to carry the heavy tools as they hike to the work locations. In addition to the logistics and safety teams, SCE’s Transportation Services Department helps keep the trucks and vehicles maintained and running well. Coordinating all the teams with a total of 85 employees over the project’s two-months span is Regalado, 32. A former lineman and foreman, he has also worked as a safety and environmental specialist and has been a district manager for just over a year now. His first job at SCE just out of high school 13 years ago was as an auto attendant changing tires.